Who is Derma Relief for? 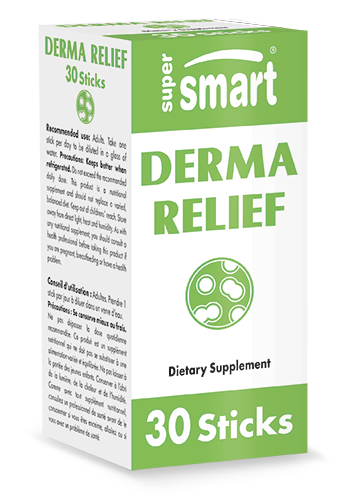 Derma Relief is aimed at anyone looking for a natural way to relieve and improve their skin problems and at those for whom standard treatments have not worked. Derma Relief’s formulation is based on a theory widely-documented in the scientific literature (1): that by taking probiotics, you create a healthy environment for your gut flora and reduce inflammation in the layers of your skin. Fructo-oligosaccharides and other oligosaccharides. The role of these carbohydrates, which are naturally present in grains, fruit and the roots of certain vegetables, is to ‘nourish’ the probiotics and help them multiply: they are called prebiotics. Vitamin C. Vitamin C optimises immune function and helps maximise collagen formation in the skin. Vitamin E (in the form of dl-alpha-tocopheryl acetate). When tocopheryls enter the body they are converted into tocopherols and become active: they play a major role in protecting skin cells from oxidative stress. Vitamin E also has anti-inflammatory and vasodilatory properties unrelated to its antioxidant activity. Vitamin B2 (riboflavin). It helps maintain the health of the skin’s mucous membranes (2). What are the mechanisms of action responsible for DermaRelief’s effects on the skin? Contrary to what you might think, probiotics are not just for preventing or improving gastrointestinal problems. We now know they confer systemic effects and that these effects can benefit the skin if the probiotic strains are selected carefully. Fabio Meneghin and his research team analysed 37 clinical trials investigating the dermatological potential of oral probiotics: 13 out of 17 were shown to be effective in terms of prevention, while 15 out of 20 displayed therapeutic efficacy (3). There are at least three mechanisms responsible for the benefits conferred by the probiotics in DermaRelief. Probiotics help strengthen the intestinal barrier’s impermeability, primarily by increasing secretion of immunoglobulin A (IgA) antibodies, the role of which is to neutralise harmful bacteria and toxins in the intestinal lumen. (4). Strengthening the intestinal barrier prevents various compounds that exacerbate skin inflammation from passing into the bloodstream. Probiotics and their derivatives modulate the immune system by activating dendritic cells (5-6), stimulating NK cells (7-8) and inducing T-lymphocyte differentiation. Dendritic cells and T lymphocytes are indeed instrumental in the improvements observed in the skin following probiotic treatment. Their effects on the immune system produce anti-inflammatory benefits via an increase in production of interleukin 10 (IL10) (9-10), a powerful anti-inflammatory cytokine secreted by the body in response to a number of pathological conditions such as eczema and dermatitis. This mechanism relates to the capacity of emotional states (such as depression and anxiety) to alter gut microbiota, increase intestinal permeability and promote systemic inflammation. Lactic probiotics may be able to moderate the release of a neuropeptide (a polypeptide functioing as a neurotransmitter and neuromodulator) called substance P (11). This neuropeptide is released by the nervous system in response to pain, stress, mood problems and anxiety, but it is found abundantly in the skin in atopic dermatitis, eczema and other skin problems (12). By restricting its release, probiotics thus help reduce skin disorders. What are the key reasons for taking DermaRelief? If you’re still wondering whether to try DermaRelief, here are six reasons that should convince you. Hyperactivity in the skin’s immune system (keratinocytes, dendritic cells and T lymphocytes) is seen in many dermatological conditions (13-16). Intestinal transit problems and diseases such as Crohn’s disease and IBS very often have dermatological manifestations (17-18). In most of the world’s cultures, people have been consuming fermented foods (containing probiotics) for at least 8000 years. It has been shown that diet can help protect skin cells from the inside through a targeted intake of tocopherols and vitamin C in particular. Animals deprived of gut flora are seen to have fewer B and T lymphocytes, dendritic cells and immunoglobulins, and significantly increased inflammation: all of which are corrected by supplementation with probiotics (19). DermaRelief is comprised of four bacterial strains rigorously selected for their probiotic potency, and contains only one natural excipient: corn flour. Why has our gut flora deteriorated? Our gut flora enables the production of vitamins which the body is unable to synthesise, as well as the digestion of complex molecules, and even supports the efficacy of the immune system. The symbiotic relationship between the various bacterial strains that make up our gut flora has played a key role in the evolution of the human species. Nowadays however, a number of factors such as over-consumption of ultra-processed foods and excessive use of anti-microbial agents have unfortunately contributed to a profound change in the diversity and quantity of the beneficial bacteria colonising our intestines, a significant development given that women pass their microbiota onto their babies (20). At the same time, incidence of skin allergies and chronic dermatological conditions is continuing to rise, especially in Western countries. Probiotic supplementation helps restore the balance of microbiota when it has been disrupted, for example, by antibiotic treatment (21). What measures can be combined with DermaRelief? take steps to reduce your stress levels: it stimulates allergic responses and exacerbates eczema flare-ups (23). Can I take other supplements at the same time as DermaRelief? DermaRelief can be happily combined with other supplements formulated to boost the immune system such as AHCC or those designed to maintain the structure of skin tissue such as Polypodium leucotomos, an extract of fern popular in South American traditional medicine. In order to achieve the 1:1 ratio of omega 6:omega 3, it may also be helpful to take omega-3 supplements. How should DermaRelief be taken? The product comes in 2g sachet ‘sticks’ which contain 3 billion lactic bacteria, which should be kept refrigerated. One stick a day is a sufficient dose. You can either dilute the contents of the stick in a glass of water and drink, or swallow it straight from the sachet.